Lawnmower Engine used to power the go-kart. A Clutch system to allow the engine to idle. Using brakes of a bicycle. I’ve just finished all the 3D Modelling of the kart, and will be doing the Plans and 2D Drawings very soon. Meanwhile below is a taster of what the Lawnmower Engine powered Go-Kart looks like. 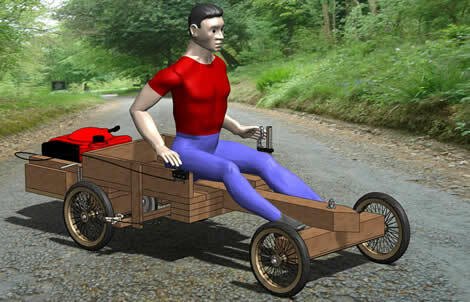 I did have old plans for this wooden kart, however they were very old, and done in 2D CAD. 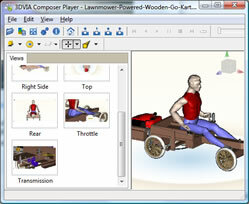 If you want to view the Kart in all it’s 3D glory (including details on the throttle and clutch system), click to download the 3DVia Viewer Package of the Wooden Kart (3 MB). Stay tuned to www.kartbuilding.net where I will be publishing the complete set of plans for this engine powered kart. I will also be making some videos showing the assembly of the kart, the key components and the operation of the kart. Following the tips and feedback of many people who contacted me at , I will be making a complete Bill of Materials / Shopping List of part and components, so that anyone will be able to build this kart. If you have any requests on what is included in the 2D printable plans, drop me an email. Thanks for putting this together! It looks very cool so far. I’ll be checking back to see the full plans. Thanks Lee. I’m currently doing up the 2D printable plans. Once I’ve them done I’ll do up some assembly videos showing how the various bits of the kart goes together. This blog compliments the main www.kartbuilding.net free kart plans website, and contains regularly updated tips, information and diagrams relating to kart design, kart plans and all aspects of kart building. 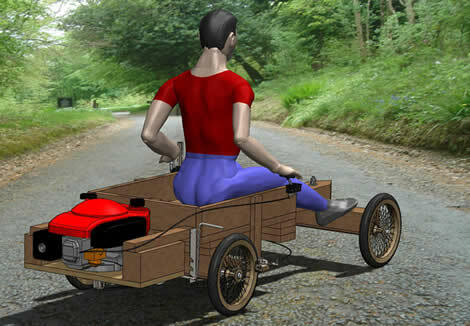 Want some pedal power for your wooden go-kart?